Review: One night in Los Angeles a cab driver finds himself the hostage of an engaging contract killer as he makes his rounds from hit to hit. 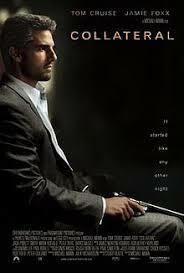 Tom Cruise is very well cast and gives a brilliant performance. Apparently Michael Mann once said, “Vincent is a man able to get in and out of anywhere without anyone recognising or remembering him”. To prepare for this film, Tom Cruise had to make FedEx deliveries in a crowded Los Angeles market without anyone recognising him. Jamie Foxx had to prepare for his role, it was to be a cab driver. This is one of Michael Mann’s best directorial efforts. He makes the film moody and dangerous. The whole film was shot on a mixture of film and digital video. The script is very well written and thought out. The film opens with a scene that reminded me of Rear Window (1954). At the Bafta Awards in 2005 this won Best Cinematography.